I'm not one to be squeamish - gutting fish, filleting meat etc. doesn't bother me however the thought of eating a heart made me feel rather uneasy. It's certainly not something I would usually choose to cook let alone dine on myself. But someone I love has a fondness for all things offal and so to please them, I have gradually been working my way up to tackling a meal made with heart by cooking the more minor(?) organs first. Hearts are actually a really sensible choice for the meat portion of your main meal. The heart is an incredibly lean part of an animal as it is doing so much work so you won't be eating lots of unhealthy fat when cooking this or any other heart-based dish. It is also one of the most inexpensive cuts available. You only need one heart per person (hmm, that doesn't sound quite right but you get my meaning) the cost of which is between 30p and 50p. So you can feed a family of four for under £2. I would highly recommend trying out this recipe as it's not only tasty but wholesome for your bank account and body too. Sear the lamb hearts for a few minutes in a casserole dish on the hob until brown all over and then set aside on a dish to cool. In the same casserole dish you used to sear the hearts fry an onion and the three cloves of garlic until softened and starting to brown. Keep the casserole dish (plus the meat and onion scrapings) until later for the braising liquid. To create the stuffing for the hearts tear up the bread and place into a blender. Blend until it creates a breadcrumb texture with no big lumps. Add the softened onion and garlic mixture along with the parsley and thyme to the blender and blitz until a fine consistency. Mix in the egg and stuff the hearts with the mixture. If you have any leftover stuffing form it into balls and place to the side. To make a good base for the braising liquid add the carrot, celery, onion, leeks and garlic to the casserole dish and fry gently until they are starting to soften. Melt some butter in the pan and then add a sprinkling of flour and stir thoroughly. Add some tomato puree and ensure all the vegetables are fully coated before adding the chicken stock to the pan. Allow the liquid to come to the boil then turn down the temperature to simmering point and add a splash of red wine. Place the stuffed hearts and any leftover stuffing balls into the liquid and simmer on a low heat for 1 to 2 hours before serving. I'm really excited (and a little nervous) to say that I have written an article called Realities of Recovery: Navigating the sometimes treacherous waters of recovery for Issue 1 of The Pillow Fort magazine. If you don't know anything about The Pillow Fort click here to go to their website which is chock full of useful articles and products to help people suffering from long-term and chronic conditions. The publication looks like an incredible magazine packed with informative, interesting and relevant articles, photos and other contributions. In fact I was so gripped while reading it I burnt the dinner I was cooking at the same time! 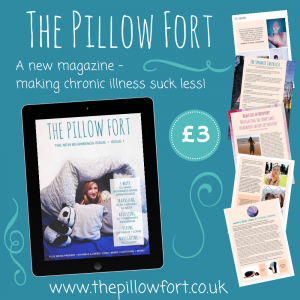 My thanks have to go to Lizzy from The Pillow Fort for giving me this opportunity and creating an invaluable source for people struggling through illness. I hope that any of you who read the magazine enjoy what you find there and gain something helpful from the experience. After weeks of gorging on sugary, fatty (and delicious) foods, drinking alcohol and burning the candle at both ends it's no wonder that a lot of people catch a cold in January after the Christmas period as these can all contribute to lower your immune system. For the general population getting a cough, cold or sore throat is usually nothing more than an unpleasant experience for 3-4 days however, those of us who are already depleted because of ill health can be hit a lot harder by the common cold. People with chronic conditions can be much more susceptible to bacterial and viral illnesses and the resulting illness and repercussions lasting weeks or months with the added symptoms causing extra pain, exhaustion and complications to pre-existing conditions. This can also be said of people who are in a recovery phase. One of the most feared things during times of chronic illness is experiencing a relapse, especially if you have managed to regain some ground towards good health. It can be a frightening feeling thinking you may be coming down with a bug and admitting you are feeling worse than you usually do. During a recovery if there are any blips (like getting a cold etc.) you may start to feel as if it's the beginning of a backward slide and panic and push yourself harder to make progress. If you feel unwell then try to take it easy. Be careful. Take regular rests and try not to think that you are going to lose all that hard earned progress. Below I've listed a few things that might help ease those aches and pains plus a couple of my own remedies that might hit the spot too! Hopefully this will help get your body back on track and nip anything in the bud before it takes over and threatens your health seriously. Analgesic medication - if you have a fever or are in discomfort then taking something like paracetamol or ibuprofen can help in the short term. Tiger Balm - an amazing little pot of goodness. This multi-purpose salve is great for relieving sore noses and rubbing on temples to soothe headaches. The best way to describe it is Olbas Oil mixed with Vaseline. It's a mentholised balm that I use to slather on my nose that clears the airways and helps moisturise and heal your nose after all that blowing. Apply regularly throughout the day. Also great for massaging into sore and tired muscles all over the body. Tissues - an obvious one I know! However people seem to not realise how important it is to blow your nose when you have a cold. I think some people have a bit of a mental block or 'thing' about blowing their nose but unfortunately there's no way around this one. It's no use dabbing at it in a vain attempt to clear it or constantly sniffing. All that gunk has got to come out and it won't move unless you give it some encouragement! Do be careful not to blow your nose too hard though - you don't want to give yourself a headache. Because you will be blowing your nose quite often make sure to use soft facial tissues rather than anything horribly scratchy otherwise you'll add an incredibly sore nose into the bargain. Lip Balm - I find that my lips get very dry when I have a cold so I make sure I have a good quality lip balm with me to apply when I need it. Avoid preparations that contain camphor as this will only dry your lips out more. TCP - is an amazing antiseptic tonic that is excellent when diluted with water and gargled to help sore and inflamed throats. It's a strong concoction but it works wonderfully. Water - drink plenty of water to hydrate yourself and flush out those toxins. Manuka Honey - wonder ingredient. Antiseptic, antibiotic, antifungal, anti-inflammatory benefits. Make sure to buy manuka honey with a UMF rating to ensure efficacy. Green Tea - full of antioxidants and has antibacterial properties. A great drink on it's own or added to a hot toddy recipe for extra benefits. Fresh Ginger - Anti-inflammatory, antioxidant, immune boosting and anti-sickness benefits. It's also a very warming ingredient than can soothe sore throats and sensitive stomachs. Top Tip: peel ginger root with a teaspoon to get the skin off. So much easier than trying to cut it off. Lemon - packed with Vitamin C, antiseptic and antibacterial agents. Use the whole lemon not just the juice to get maximum effects. Infuse the ginger and lemon in hot water for at least 5 minutes. Add green tea if you like it, it's an acquired taste so not for everyone. Once the infusion is ready add a teaspoon of manuka honey to the tea and drink. It's not an old wives tale, chicken soup actually does help you feel better when you've got a cold. Ingredients in chicken soup can help ease congestion and also have anti-inflammatory benefits that can help soothe sore throats. The basis for a cold-fighting soup is a stock made from the bones of a chicken. This is really important as the bones contain lots of nutrients and vitamins like zinc and magnesium that can help boost your immune system. You can make a great chicken broth/stock by boiling up a chicken carcass (leftover from your Sunday roast) with bay leaves, fresh herbs, carrot, celery, onions and garlic. Once you've let it simmer for a couple of hours, strain to leave a clear liquid. Add vegetables and/or chicken meat to the broth and serve for a health-boosting bowlful. Getting enough shut eye is such an important thing when trying to help your body heal. During the night your body repairs itself and sleep boosts immune function, metabolism, memory, brain function and so many other things. When you are feeling run down or under the weather taking extra rest periods or afternoon naps is not only healthy but can prevent you from getting any more ill. These are just a few things that might help you if you catch a cold or are feeling below par. Ultimately there is no cure-all or magic pill to take that will prevent you getting ill. Having a good sense of yourself and monitoring how you are feeling may help you allow yourself a little extra time to heal and care for your body. I hope any of you reading this who are suffering from a cold feel much better soon and that this has helped you get some relief. Any comments or other helpful tips will be gladly received. 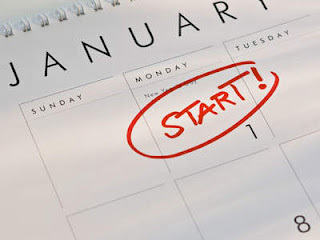 Are making New Year's Resolutions the healthiest way to start your year? I didn't want the first week of 2014 to pass without writing something about people's fixations for making New Year's Resolutions every year. Don't mistake me in thinking that I'm a cynical and pessimistic kind of person, New Year's Resolutions are a great way to embrace the new year with a list of the things you really want to achieve, work on, experience etc. 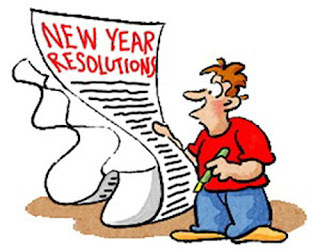 However, when did it become socially unacceptable to not make resolutions? 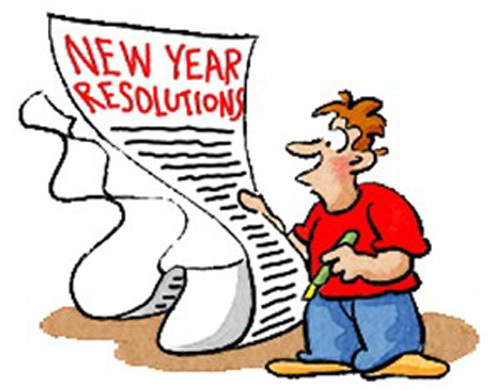 At the beginning of every year the inevitable question is asked by others "So what are your New Year's Resolutions this year?" and the general consensus if your answer is "I'm actually not making any resolutions this year" is that you either aren't ambitious, steadfast, future-thinking or motivated enough or you are depressed about the new year. These may be partly true or all true, you may be dreading the year ahead or you may not want to or feel the need to change anything in your life. On the other hand your aims for the coming year may not be as clear and concrete in your mind as in others. You may just have a general idea of where you would like to be in your life. Just because you haven't sat down and plotted out this next year doesn't mean you don't have hopes and dreams of the future. It doesn't mean that you are blindly entering 2014 with no direction. It doesn't mean that you are accepting that you can't get better/be better/feel better. It doesn't mean part of you has thrown in the towel or is apathetic about life. And it doesn't make you any worse than other people who have made New Year's Resolutions. I think a more healthy way of approaching New Year's Resolutions is to keep any ideas achievable and more general. For example instead of saying that you would like to run this year's London Marathon in under 6 hours why not make it that you would like to just run more. Or instead of setting a target to cut out dairy, wheat and sugar from your diet you could make it a little more flexible by cutting down on them by not buying cakes or cheese with your usual shopping or just eliminating one of them as a more manageable goal. I think the most important thing to do is to not think that it's the be-all and end-all to set and achieve New Year's Resolutions. A few little targets are a great thing to keep in mind throughout the year as a motivational tool but not as a way to beat yourself up or make yourself feel like an underachiever or failure. In conclusion, if you're going to make New Year's Resolutions this year then try to make them more realistic and attainable. Having someone who knows what it is you want to achieve can be a helpful thing or doing something as a joint resolution can be a more fun and fulfilling pursuit than going solo. Whatever your wishes and goals for 2014 I hope that it's a wonderful year for you all.